When you retire, how much do you expect to rely on Social Security -- will it be a major source of income, a minor source of income or not a source at all? Next, I'm going to read a list of problems facing the country. For each one, please tell me if you personally worry about this problem a great deal, a fair amount, only a little or not at all? How much do you personally worry about the Social Security system? Next, we'd like to know how you feel about the state of the nation in each of the following areas. For each one, please say whether you are -- very satisfied, somewhat satisfied, somewhat dissatisfied or very dissatisfied. If you don't have enough information about a particular subject to rate it, just say so. How about -- the Social Security and Medicare systems? 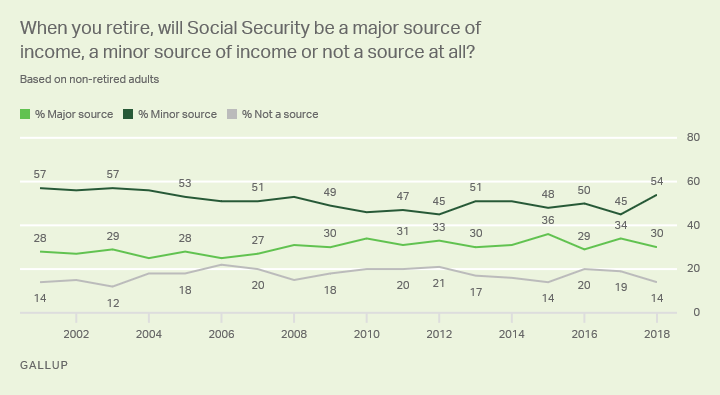 How much do you rely on Social Security today -- is it a major source of income, a minor source of income or not a source at all? Do you think the Social Security system will be able to pay you a benefit when you retire? Do you think the Social Security system will be able to continue to pay you full benefits, or do you think there will eventually be cuts in your benefits? Which of these statements do you think best describes the Social Security system -- it is in a state of crisis, it has major problems, it has minor problems or it does not have any problems? If you had to choose one of the following approaches to ensuring Social Security's long-term future, would you rather -- [ROTATED: raise Social Security taxes (or) curb the amount of benefits for future Social Security recipients]? How long do you think it will be until the costs of the Medicare and Social Security programs create a crisis for the federal government -- are they already creating a crisis, will they create a crisis within the next 10 years, within 10 to 20 years, in more than 20 years or not for the foreseeable future? Now I'd like to ask you about the major entitlement programs the government is committed to, including Social Security and Medicare. Do you think the cost of these programs will create major economic problems for the U.S. in the next 25 years if no changes are made to them, or not? Assuming there would be no change in Social Security benefits for those who are now age 55 or older, do you think each of the following would be a good idea or a bad idea to address concerns with the Social Security system? How about -- [RANDOM ORDER]? How much planning would you say you've done for your retirement-enough planning considering your present age, some but not enough planning considering your present age, or no planning at all? Based on what you have heard or read, in general, do you approve or disapprove of George W. Bush's approach to addressing the Social Security system? As you may know, a proposal has been made that would allow workers to invest part of their Social Security taxes in the stock market or in bonds, while the rest of those taxes would remain in the Social Security system. Do you favor or oppose this proposal? Who do you trust more to deal with the issue of Social Security retirement benefits -- [ROTATED: the Democratic Party (or) the Republican Party]? Do you think the federal government should make major changes in the Social Security system to ensure its long-term future -- in the next year or two, within the next 10 years, or do you think major changes are not needed within the next 10 years? As you may know, a proposal has been made that would curb Social Security benefits for middle income workers in the future, curb them even more for higher income workers, but would not affect benefits for lower income workers and those born before 1950. Do you favor or oppose this proposal? Do you think it is possible to ensure the long-term future of the Social Security system without either raising YOUR taxes or cutting YOUR Social Security benefits, or is that not possible? As you may know, one idea to address concerns with the Social Security system would allow people who retire in future decades to invest some of their Social Security taxes in the stock market and bonds, but would reduce the guaranteed benefits they get when they retire. Do you think this is a good idea or a bad idea? Do you think political leaders in this country are -- [ROTATED: moving too slowly, (or) moving at an appropriate pace] -- in taking up legislation to change the Social Security system? Which do you think is riskier for average American workers today -- [ROTATED: investing some of their Social Security taxes in stocks and bonds, (or) relying on the Social Security system to pay them the current level of benefits when they retire]? Do you think the Social Security system will -- or will not -- be bankrupt by the year 2042 if major changes are not made to the system? Suppose Americans were allowed to invest a portion of all the Social Security taxes that they paid in their lifetime in stocks and bonds. When they retired, do you think most Americans would receive -- [ROTATED: higher Social Security benefits than the government would provide, about the same benefits or lower Social Security benefits than the government would provide]? 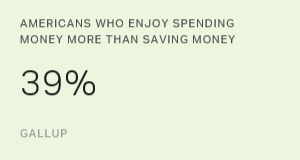 Just 20% of nonretired investors have heard at least a fair amount about "super-saving" strategies to retire early, but 72% think they could benefit from them.